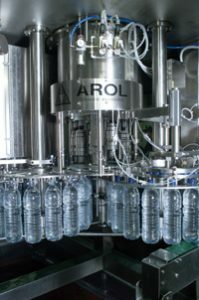 Enterprise Tondelli have been supplying capping, crowning corking machines from Aro l Spa who are a world leader in closure technology. We can apply crowns, natural corks, synthetic corks, stoppers, plastic screw caps, wide mouth closures, sports caps, trigger dispensers etc. Decappers for removing caps on returnable lines. Turret mounted cappers on existing monoblocs. 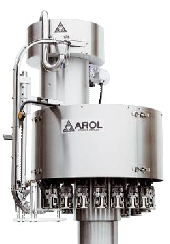 Recent projects for instance include a single head “T” shaped corker for 3,000 bottles per hour, a sixteen head free-standing natural corker for 24,000 bottles per hour, dual purpose four head capper for both plastic screw caps and also ROPP caps. Each capping head servo motor driven so the closing torque can be precisely controlled. This is especially important when capping PVC bottles with a limited thread. 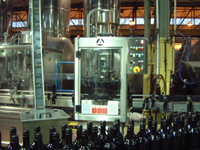 Vacuum suction in a controlled chamber to reduce air pick up in sensitive products such as wines etc. The use of inert gases can also be accommodated. “Baseless” cappers. These were developed for one of our filler manufactures who manufacture a rinser/filler/capper where all the drive elements of the machine are mounted overhead with the closure carousel suspended from above. In the free-standing capper all the elements of the capper are suspended from above including the wormscrew etc so that a clean and clear floor is given. These have big advantages when hygiene is important.